I love Ravens. I grew up in Southeast Alaska where there are a lot of Ravens. We also had a fair number of Crows, but I hate Crows for being loud and annoying, so I refuse to draw a paper doll gown based on them. So, this is a Raven Masquerade dress that Margot, of the Marisole Monday & Friends paper doll series, is modeling. Ravens are some of the smartest birds in the world and they can do fairly complex problem solving. No unsurprisingly, they show up a lot on myth and legend. In Tlingit stories, Raven is trickster who frees the sun, moon and stars. In Norse mythology, the god Odin is depicted as having two ravens serving as his eyes and ears. They are named Huginn (thought) and Muninn (memory). In Ancient Greek myths, ravens are associated with Apollo, the god of prophecy. And of course, there are always the ravens of the Tower of London who, should they ever be removed, would foretell the fall of the Kingdom of England. So, if you want folklore heavy animals, it doesn’t get much better than the Raven. This is the most fitted of the gowns. There’s something mysterious about Ravens and I wanted the masquerade gown to capture some of that mystery. Here are some instructions for the wig, if you’re not sure how it works. If you like the blog, please think about supporting it on Patreon. So, I am curious, what is the favorite Masquerade gown so far? Let me know in a comment! There is something really silly looking about flamingos. Still, I love their color and I wanted to do something a little playful for one of the masquerade gowns, and who doesn’t want to dress their paper doll up like a flamingo? I was trying to research flamingo folklore and I didn’t find much. I did however find a great history of the pink plastic lawn flamingo, should anyone be curious. I also learned, though I haven’t been able to confirm this through a really reputable source, that in Ancient Egypt Flamingos were considered sacred to the sun god, Ra. The over-skirt of the gown is meant to mirror the fuller body of the flamingo. Originally, I had a very narrow skirt attached to the bottom, but later I altered it to fit in better with the rest of the gowns. Due to the very low neckline and decorate edging, I think the dress will work best with floating tabs, so I positioned two on the page. You may need to add some longer floating tabs for the skirt. 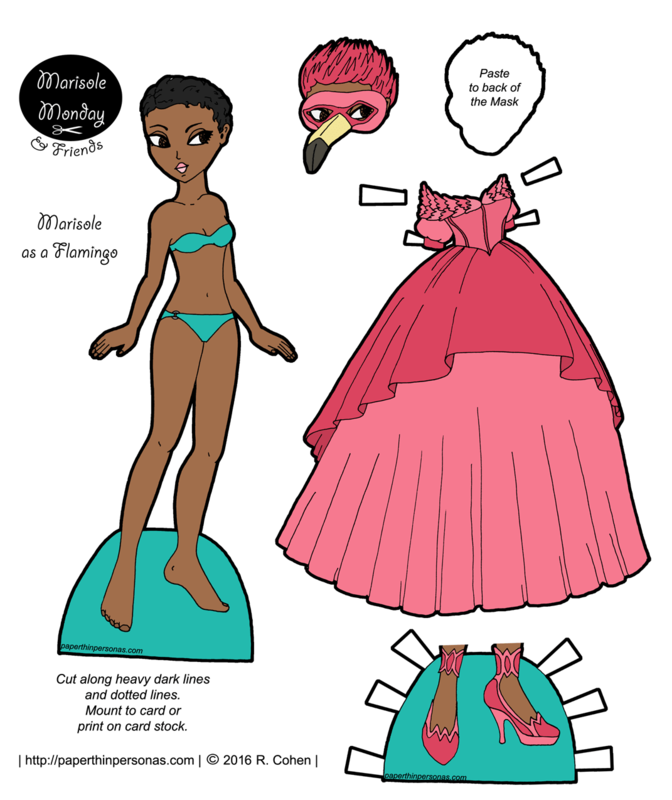 Our printable model for the flamingo costume is Marisole. I thought her light brown skin-tone would be set off really beautifully by the pink gown. If you’re not sure how the wig works, here are instructions. Also, I would recommend adding some additional tabs to the skirt as needed. It is a very wide skirt. Read the blog regularly? Than help it continue by supporting it on Patreon. Halloween always feels like it is a holiday ripe for paper doll activity. It’s all about costumes, after all. So, while I abandoned themes last week, I will be returning to them this week. Each day this week there will be a different Marisole Monday & Friend’s doll and her bird themed masquerade ballgown. Meaghan is starting us off with an owl themed paper doll masquerade dress which was the first of the dresses that I designed. The sketchbook page of this gown on Instragram went up a few months ago, but it can take a long time for things to be finished. My goal was to capture the idea of an owl without being specific to species, so the buns on her head are supposed to be like the owl’s ears and the layers in the skirt give a sense of wings. Due to the width of the skirt, I would strongly recommend adding some floating tabs to the back of it. Her wig is designed to work with my usual method of pasting the back to the front and leaving a pocket for the dolls head. Here are the full instructions. I really should do full instructions on floating tabs, but I haven’t gotten around to it yet. Now, tomorrow there will be a flamingo and after that, I haven’t decided which ballgown will go up next. If you love the blog, consider supporting it’s continued existence on Patreon. Sometimes, I feel like drawing a different sort of paper doll, so today we have a little pink skinned retro alien astronaut paper doll, because why not? Over the course of the year, I have continued to move closer to my roots. And today, I am moving there even further. When this site started, before the whole thing went down in flames in 2009, there was just one series and that series updated with whatever the heck I felt like. Later, I added the first Curves series, but continued to post whatever I felt like. Starting today, I am going to abandon weekly themes, except when I feel like there is a real reason I want to do one. For example, I have only one astronaut paper doll until today. For several years, I’ve wanted to draw a really retro inspired, pin-up inspired sort of astronaut, but I’ve never wanted to make a whole set like that. But during my short hiatus I had an epiphany, I realized that I didn’t have too. There was no reason I had to do a whole week of retro-astronauts. I could just do one! And on the next day, I could do something else entirely. So, today enjoy this “Friend of Marisole Monday” and her retro inspired astronaut suit. I also gave her a pair of somewhat impractical shoes, because I thought she might want to wear something other than her space suit and with her pink skin, burrowing shoes might be straight out, unless they were boots. Thoughts on the new plan? Do let me know in a comment. And if you love the blog, than think about supporting it through Patreon. Originally, back when I was making plans, I hadn’t planned on doing two contemporary fashion sets in a row. I thought I would do something else between, but then I ended up needing to move and life has away of laughing at our best laid plans. So, here I am posting two contemporary fashion printable paper doll sets in a row, but they couldn’t be more different. Last week, I forayed into Hip-Hop paper doll fashion. This week we are sticking with what I am far more comfortable with, summer fashions from the fashion magazines like In-Style and Vogue. This week, our paper doll model is Marisole. As some of you probably remember, Marisole is the first of the Marisole Monday & Friend’s paper dolls and she leads our charge. Today, she has a strapless jumpsuit and a pair of white shorts. I swear later on there will be top options to go with her shorts. This week’s theme is fresh summer fashions- expect a lot of whimsical prints including lemons and flamingos, plus sundresses and cropped tops. And of course, there’s Patreon if you want to help support the blog, plus PTP is on twitter- @paperpersonas. Twitter is a great way to ask me questions, because I tend to answer them faster than comments. As I promised yesterday, today there’s some music to do with yesterday’s flute. 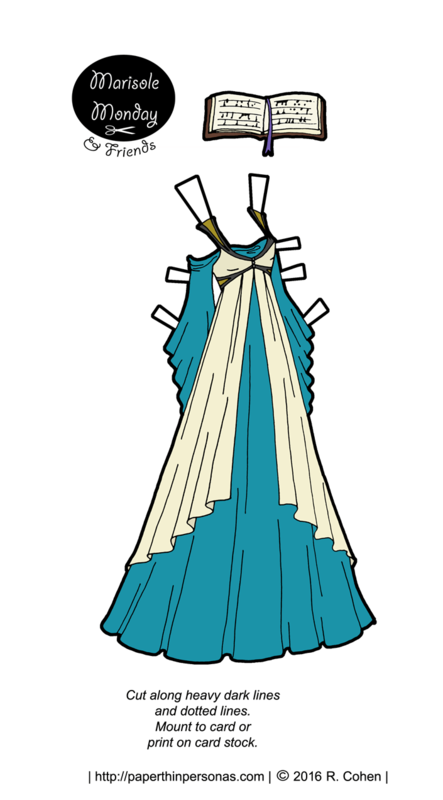 The process of designing fantasy paper doll dresses usually begins with a silhouette. For example, I wanted all these dresses to be high-waisted and very full at the hem making a distinct a-line shape. Each gown also has an “over-robe” and an “under-robe” creating a consistent look. This is part of what I think about each set. I’m really not designing “four dresses”, rather I’m designing a week of themed dresses, so I try to think about a connecting thread either with a time period (like I did for the Poppets of the 1860s) or a stylistic choice- like making all these similar in their silhouette. I’m not suggesting for a micro-second that this is always easy, but I find I think better in themes, though once in a while, I am tempted to just do a random week of whatever occurs to me; however, I don’t know if that style would be sustainable for me for a long period. I like being organized, what can I say? I blame it on the librarian in me. The librarian in me is also why I like drawing books for my paper dolls so much. I tried something kinda new here in that I drew an open book, rather than my usual closed book. I know basically nothing about music, except how it was printed and that’s hardly much to use when one is trying to play it. I faked my “music notes” here just to give it something that clearly wasn’t text. I think this might be my first music book, so maybe the other paper dolls with instruments just play by ear? 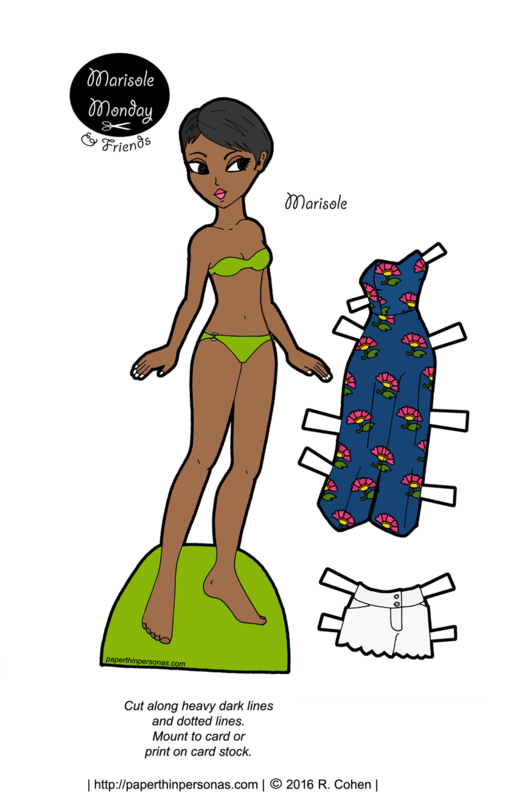 If you missed Monday, here’s the paper doll to go with this dress, though it will fit all the Marisole Monday & Friend’s paper dolls, so there’s no reason not to share. By the way, I am currently collecting people’s thoughts on the new format after six weeks. If you haven’t tossed in your two cents, please do in a comment. If you have already tossed in your two cents, feel free to toss them in again. I won’t mind. This is the second Meaghan printable paper doll of 2016, which seems surprising to me, but I checked the archives and its true. When my real friend Meaghan allowed me to name a paper doll after her, she demanded fantasy dresses, so I do my best to provide them as often as I can for her paper surrogate. I’ve been thinking a lot about what the best ways to break up a paper doll across five days really are. Shoes are often an issue in paper doll creations, because skin is exposed. While any paper doll in the same pose can share dresses, only paper dolls with the same skintone can share shoes, especially shoes like these where even and exacto-knife couldn’t make some of these sandals work on my Edwardian Mia from the week before last, for example. So, rather than start out with a paper doll and a dress this time, I am starting out with a paper doll and some fantasy sandals. There won’t be an accessory Thursday this week, instead each day there will be an accessory to go with the dress on display. Also, I have a question for all my lovely readers, now that we’re five or six weeks into this new format, what do you all think? Please let me know in a comment.